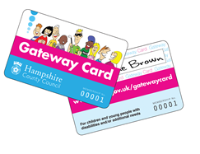 What is the difference between the Yellow Card and the Gateway Card for disabled people in Hampshire? The Yellow Card is issued when you register as disabled with Hampshire County Council. Your information is included on a database so that the Local Authority can understand how many disabled people there are in Hampshire. The yellow card can be used as proof of disability, eg when applying for the visually impaired rate for a TV licence. Some organisations will accept the card as proof of disability but this varies depending on the organisation. The process to apply for a Yellow Card is different depending on whether you are a child (up to your 18th birthday) or an adult (aged 18 and over). If your child has a Social Worker they will be able to apply for a Yellow Card for you. Otherwise, you can apply for a Yellow Card for your child by phoning Hants Direct on 0300 555 1384. Paperwork will then be sent to your child’s GP so they can confirm that your child is disabled and once this confirmation is received a Yellow Card will then be issued. If your child's disability is identified as a lifelong condition then the card will last indefinitely and the registration will pass to Adult Services when your child turns 18. However, if your child's condition may change over time the card will be issued for a fixed period and you will need to renew it once it has expired. To renew the card phone Hants Direct on 0300 555 1384 and you will be passed to the appropriate professional team who will look at each renewal case individually. The application process for the Yellow Card is slightly different. You will need to go to this website and complete the form or you can call Adult Services on 0300 555 1386. You can also go to this website if you need a replacement card. The yellow card can be used as proof of disability, eg when applying for concessionary travel or the visually impaired rate for a TV licence. The Gateway Card is for young people between the ages of 0-19 years (up to their 20th Birthday). It can be used as proof of eligibility for Hampshire’s Short Breaks programme and also as evidence of disability in some cases. If you are a parent of a child who needs additional support to attend leisure or play activities, you can register for a card here. Organisations who are receiving Short Breaks funding should ask for the Gateway Card number when you contact them to book a place. Some leisure providers will offer a concessionary rate for holders of the Gateway Card. You can see who these providers are and what services are available, as well as find out more information about the Short Breaks and Buddy schemes, by looking at the Leisure and Play webpages. The Gateway Card also offers access to the Community Buddy Scheme, which is available to disabled children and young people between the ages of 7 and 19 years. A Short Break enables children and young people with disabilities and/or additional needs to join in with safe, fun and interesting activities while at the same time giving parents/carers an opportunity to have a short break from caring. When your child or young person is a wheelchair user or has limited mobility it can be difficult to find places to go that are accessible.